The Keysight 34131A is a transit case. 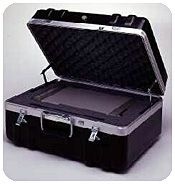 This heavy-duty hard cover carrying case is constructed from rugged A.B.S. and has a rubber-grip, steel handles and steel latches. Extra storage beneath the instrument can hold manuals and other accessories. The case can be padlocked for security. Its foam mold fits most 2-slot, half rack sized Keysight instruments. The Keysight 34131A is compatible with the Keysight 34460A, 34461A, 34401A, 34410A, 34411A, and 34420A DMMs, the Keysight 34970A/34972A Data Acquisition/Switch Units, the Keysight 531xxA and 53200 Series frequency counters, the Keysight 33120A, 33220/250A, 33521A/33522A, and 33500B series function generators, most E3600 power supplies and other 2-slot, half rack sized Keysight products.